Historian Greg Koos has been working to republish nineteenth-century county atlases of McLean County, Illinois, and in the process has noted some peculiar details. 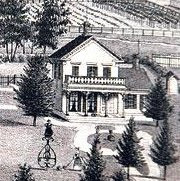 In the 1874 Atlas, a lithographer for the Dennis Kenyon farm in Mount Hope Township even took note of a damaged tree in the front yard. "Look at that tree," said Koos. "It's been blasted by lightning." There also is a bit of whimsy that only the careful examiner catches.